Hawk Mountain’s American Kestrel Poster displayed on Cedar Crest College lab door. ﻿ On October 23, assistant professor Allison Cornell visited Hawk Mountain from Cedar Crest College to provide a seminar on the physiology of developing American kestrels, emphasizing the role of the Sanctuary’s nest box program in her research. Collaboration between Dr. Cornell and Dr. JF Therrien, senior biologist at Hawk Mountain, began in 2017 and has resulted in exciting science concerning a widely-appreciated falcon species that has been experiencing declines nation-wide. 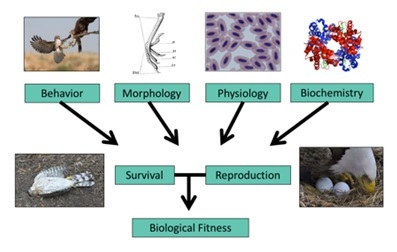 As a physiologist, Dr. Cornell’s methods include the assessment of internal as well as external factors that could influence the survival and overall condition of developing birds. Her past work has included assessing the relationships between nestling condition and oxygen storage capacity and identifying how factors such as timing of breeding are related to developmental cues in starling chicks. This type of research adds color to the bigger ecological picture, allowing us to learn more about why birds exhibit the behaviors they do, and how this relates to their overall survival. Factors like pectoral muscle mass, aerobic capacity, red blood cell count, and wing area are just a few telling descriptors that can shed light on what prepares a bird to leave the nest. Turns out, there’s more to it then being kicked out by your parents! For Dr. Cornell, Hawk Mountain’s kestrel nest box program has been instrumental to the success of her research. Nest boxes provide an opportunity to observe kestrel development in a natural setting rather than in a lab where results can be compromised by the lack of true environmental influences. 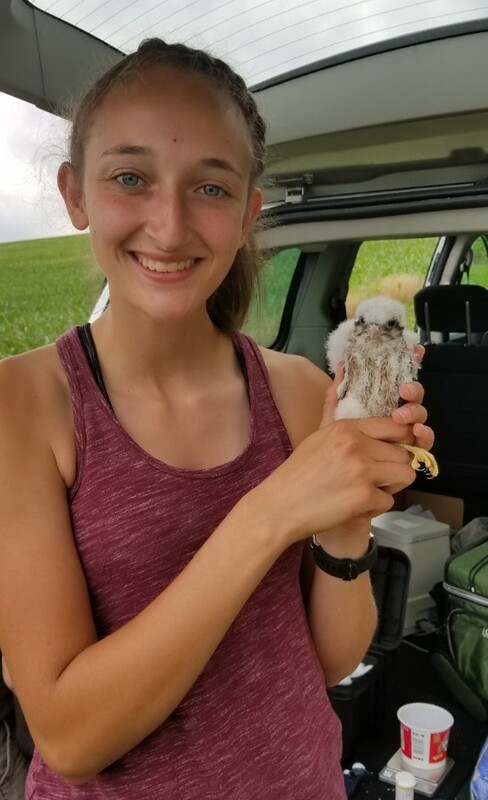 In addition, the nest box program has done the ground work of establishing relationships with landowners, which allows for Dr. Cornell’s research to be conducted in a kestrel-friendly culture. Hawk Mountain sees immense value in partnering with an experienced researcher who has the time and passion for conducting good-quality science using Hawk Mountain’s long term data set and putting in the field time to monitor boxes. In addition, trainees and students from both sites are benefiting from the academic opportunities included in this project. Mercy Melo, a student at Cedar Crest, and Jen Houtz, a former conservation science trainee, are both currently involved in the work with Dr. Cornell. Through the deployment of nest cams and this thorough approach to ecology, Dr. Cornell has given students access to several thought-provoking research topics, including how physiology traits change across nesting period and whether “dead beat” falcon dads have an impact on the physiology of their young. This work has the potential to fill information gaps and provide necessary context to the kestrel decline. Map from Raptor Population Index showing population status in different regions. Red arrows signify significant declines. Collaboration between Hawk Mountain Sanctuary and Cedar Crest College has opened doors to new research, and has also given young professionals the chance to step into raptor ecology with resources that are not always easy to come by: a long term data set, accessible observation sites, and supportive advisors from neighboring institutions. This is a clear win-win for raptor conservation and one that Hawk Mountain is thrilled to be a part of. Click here for more information on our kestrel nest box program, or see below for Allison Cornell’s. Kirsten with a recently banded male American kestrel. Over the last year I transitioned from my familiar world of science education and immersed myself in the exciting field of raptor research! In January, I was lucky to have the opportunity to travel to Cape Coral, Florida to learn about American kestrels with Hawk Mountain research biologist Laurie Goodrich, and long-term kestrel researcher Sue Robertson. Sue and her husband Bob first noticed the abundance of American kestrels wintering in Cape Coral in the late 1980’s. They began trapping and banding the birds, and nearly 30 years later the data is still being collected. These small falcons prefer open fields with low grass, which makes it easier for them to spot their prey. In the winter, these birds have plenty of insects to eat in Florida, but they also find small rodents appealing. This was our bait of choice. We searched for kestrels as we drove around the northern part of the peninsula, which is less developed than the southern part. When a bird was spotted, we would toss the trap out the door of the car, taking care to do this quickly and stealthily. It was then a waiting game for the bird to abandon its perch and land on the trap. Once we had a bird trapped, we moved quickly to release it and begin the banding process, during which Sue taught me how to measure the length of the tail feathers and the wing chord. The majority of birds we trapped were male, which was interesting because 30 years ago Sue found that the majority of the small falcons in the same area of Cape Coral were female. In the past, this may have been attributed to females migrating earlier than males and therefore staking a claim on the available optimal habitat. A more equal distribution of male and female kestrels in the optimal habitat in Cape Coral, as we observed, may be a reflection of the declining trend in American kestrels that scientists are seeing nationwide. Over the past 30 years, the available kestrel habitat of Cape Coral has changed quite a bit. What was once a habitat perfectly maintained for kestrels, with mowed plots of land and plenty of telephone wires for perching (foreshadowing the impending land development), there are now rows of homes and less undisturbed open habitat. Sue teaches Kirsten how to measure and band a recently trapped kestrel. It was an invaluable experience to learn from knowledgeable and passionate conservation researchers, Laurie and Sue. Plus, it wasn’t so bad to hang out in Florida for a few days in January, and I got to catch a glimpse at a Burrowing Owl! I am back at Hawk Mountain now, and I am so thrilled to see American kestrels buzzing around farmlands near the Mountain, preparing for nesting season. Check out the Hawk Mountain kestrel nestbox cam at www.hawkmountain.org/kestrelcam, and learn more about our farmland raptor conservation efforts at www.hawkmountain.org/farmlandraptors. 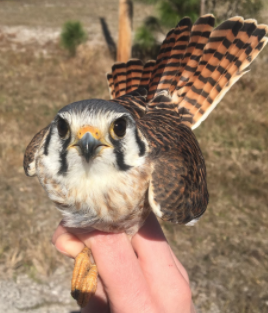 A beautiful male American Kestrel, trapped and tagged in Northern Florida.